NETWORK UPDATE: There were no changes from the preliminary New Year’s Eve numbers. CABLE HIGHLIGHTS: ESPN owned December 31 on cable, with 9 of the day’s Top 10 shows, but it was still bittersweet for the network. Last year’s COLLEGE FOOTBALL PLAYOFFS aired on January 1 rather than New Year’s Eve, but contractual issues with the specific bowls which rotate the CFP games prevented that this year, and as a result, the games were at 5.51/4.70, compared to last year’s 8.94/8.33. (On the other hand, last year’s New Year’s Eve Orange Bowl was at only 2.64, so the Playoff certainly gave it an upgrade.) The only other network to air a Top 10 show was CNN, although oddly it was the post-midnight NEW YEAR’S EVE LIVE at 0.47 that slightly topped the earlier gala Anderson Cooper/Kathy Griffin telecast at 0.45. 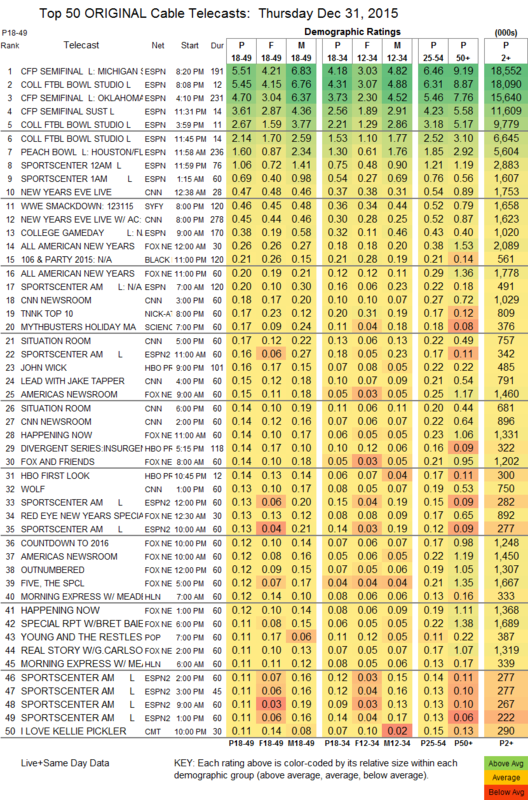 (Fox News’s inevitably titled ALL AMERICAN NEW YEAR’S was at 0.26/0.20, although in keeping with its core demo, it dominated with the 50+ set at 1.89/1.36, and BET’s New Year’s show was at 0.21.) 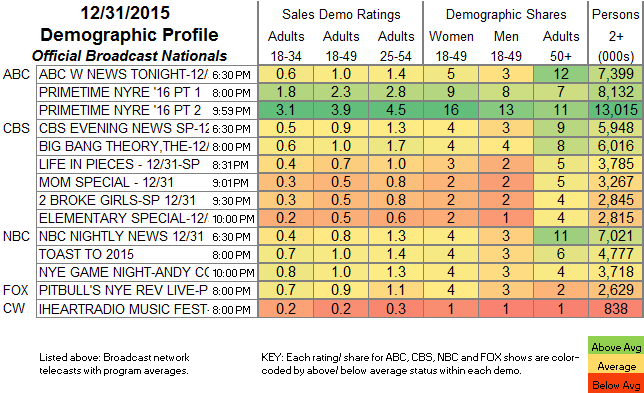 Syfy’s WWE was at 0.46. BILLY ON THE STREET (Tru) appears to have aired the lone non-sports, non-New Year’s episodes of the night at 0.10/0.09.